Mixing elements of crafting, rogue-like and platforming together to offer a 2D survival game that can be enjoyed in shorter gameplay bursts and even with friends. Set in randomly generated dungeons Magicite will have players collecting resources from trees, ores and enemies in order to craft better and better equipment to survive and advance. Ultimately you end up with a game that falls between Spelunky and Terraria which makes for a potent mix of fun. Before starting your randomised adventure players will have to choose from the 14 different races that each offer their own strengths and starting equipment. Each of these characters are suited to achieving different goals and supporting different playstyles so everyone will have their favourite. On top of choosing your race you’ll also get to choose a hat, which are unlocked for achieving certain in game feats and get assigned two random traits (which can be re-rolled) that provide small boosts to stats or other passive bonuses to further define your playstyle. Once you’ve finally settled on your ideal character to face your random adventure players will find themselves in a forest biome which always serves as your first level to ensure you have a decent foundation. This biome is made up of fairly weak enemies and an abundance of trees although future levels are often less forgiving. Magicite splits your adventure between a variety of these biomes that each have their own enemies and resources to gather. Similar to Spelunky players will have a few minutes to gather the resources they an before moving on through one of the doors onto the next biome (which could also be a town where you can purchase, sell and refine your resources). With it’s randomised and simple gameplay Magicite is perfectly suited to gamers in both the survival and rogue-like fanbase. The platforming is a bit clunky and definitely not for everyone though. 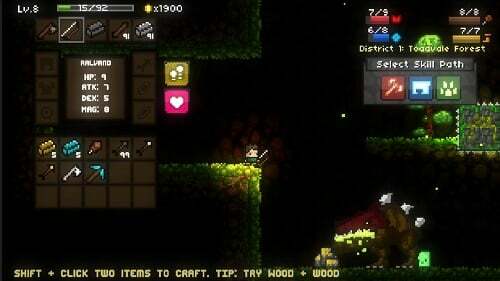 Platforming, crafting and rogue-like gameplay. Lots of customisation through class, traits and hats. Explore various biomes with their own threats and rewards. 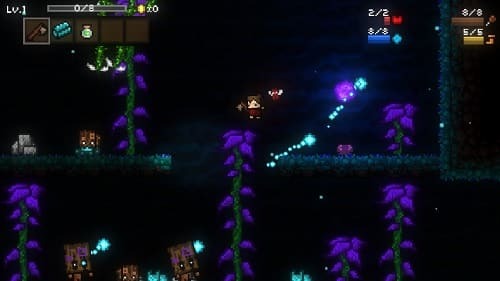 Mixture of Spelunky and Terraria in terms of gameplay. Play on Windows, Linux and Mac.